Use little snippets of autumn-colored fabrics to create a multicolored pattern on the leaves decorating this useful covered basket. Finished project size is approximately 12" x 11" x 5 1/2". Instructions may be varied for any basket size. 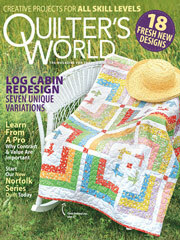 Learn more about the Annie's Quilt & Sew Daily email update and many others. Email updates may contain offers from Annie's and other companies.